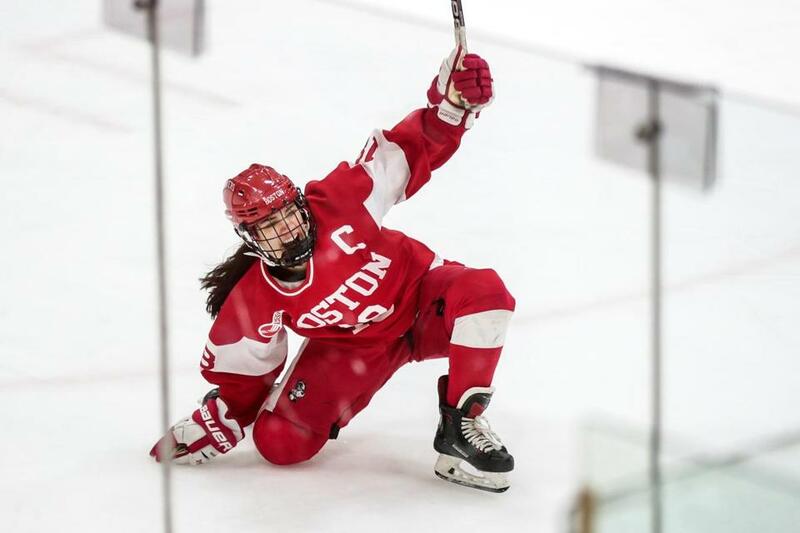 BU&apos;s Reagan Rust celebrates her winning shootout goal Tuesday in the Women&apos;s Beanpot semifinals. Boston College seemed to have plenty of advantages as three-time defending champion in the 42nd Women’s Beanpot. But Harvard capitalized on home ice, a hot goalie, and the finishing ability of the daughter of a former BC football star to take a 4-1 victory over the Eagles on Tuesday night. The Crimson (8-11-3) reached the final for the first time since 2015, and will meet Boston University (15-6-7), a shootout winner over Northeastern, next Tuesday. But Harvard had to be resourceful. Lindsay Reed (52 saves) stymied the Eagles (19-10-0) after a late first-period goal. And the Crimson were able to rally, despite being outshot, 53-26. Sophomore Brooke Jovanovich, whose father, Mike, a former Eagles’ and CFL lineman who was in the Bright Arena stands, scored twice for the Crimson. Though Harvard is the only team in the tournament with a losing record this season, all four entered the event on a positive note. BU had an eight-game (7-0-1) unbeaten streak, BC (six-game), and Northeastern (five-game) had winning streaks, and Harvard was unbeaten (2-0-1) in three games. BU recovered from 1-0, 2-1, and 3-2 deficits against the No. 3-ranked Huskies (20-3-4), winning on Reagan Rust’s shootout goal. BC opened the scoring as Makenna Newkirk redirected a Daryl Watts drive at 19:18 of the opening period, her 10th goal of the season. Harvard was outshot, 19-6, in the first and second periods, but scored twice in the second and took a 3-1 lead just nine seconds into the final period. Jovanovich equalized on a breakout at 8:10 and Dominique Petrie broke the deadlock with her fifth goal of the season, a finish from point-blank range at 13:34 of the second. Then, Lexie Laing scored her seventh goal of the season, a low shot from the right circle going through Maddy McArthur’s pads off a third period faceoff. The Crimson squandered a chance to extend the edge as freshman Kristin Della Rovere’s penalty shot was stopped by McArthur at 12:45. Jovanovich’s second goal of the contest made it 4-1. 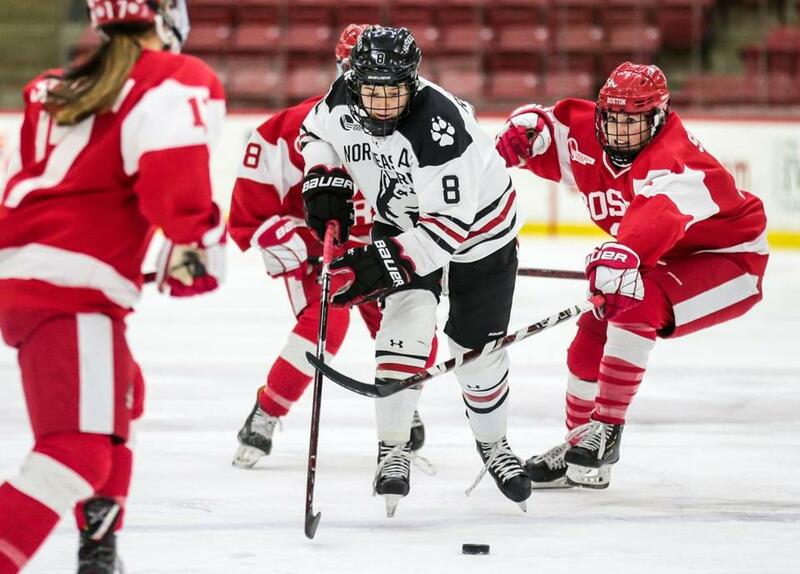 “I know this team wanted more than anything to play in a Beanpot final,” BC coach Katie Crowley said. “And maybe they were holding their sticks a little too tight and maybe they were trying so hard for that because our season hasn’t gone how we all think and everybody thinks how it should’ve gone for us. BU recovered as freshman Mackenna Parker scored her 10th goal of the season, Sammy Davis her 19th, and Jesse Compher her 15th. Northeastern opened the scoring as sophomore Skylar Fontaine converted her seventh goal of the season, finishing a rebound at the back post off a Mia Brown shot from the right circle at 10:28 of the opening period. After Parker equalized, Veronika Pettey’s power play gave NU a 2-1 edge at 6:50 of the second. Davis tied the score, 2-2, at 11:10, then the Huskies appeared to take command as Alina Mueller made it 3-2 just 17 seconds into the third. Compher converted a spectacular breakaway, roofing a shot at 2:12. 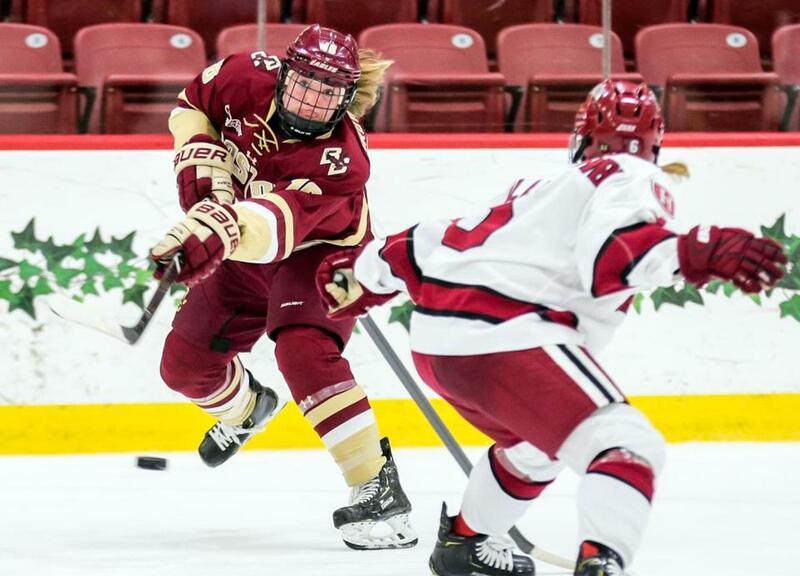 BC's Kelly Browne gets off a shot Tuesday in the Women’s Beanpot semifinals. BU's Abbey Stanley (right) tries to slow NU's Andrea Renner during the Women's Beanpot semifinals Tuesday.